The John Moores award-winning British painter Rose Wylie will be the subject of ‘History Painting’, a new multi-site exhibition at Plymouth Arts Centre and The Gallery at Plymouth College of Art, featuring a cycle of new work about the Mayflower voyage, created for this exhibition between 2015 and 2017. These paintings draw on the artist’s memories of first learning about the Pilgrims as a young child in the 1930s, and reflect on how interpretations of history change across the ages. The multi-site exhibition will have a free exhibition opening on Wednesday 28 March 2018, from 5 pm until 6:30 pm at Plymouth College of Art and then from 6 pm until 8 pm at Plymouth Arts Centre. The exhibition will then remain open to members of the public until Wednesday 30 May. Rose Wylie is best known for creating colourful, large-scale, figurative paintings that are intelligent, funny, and quietly political. These are often made from memory and draw on a wide range of cultural references from history, fashion, and Hollywood to mythology, news imagery, sports and literature. The common thread linking these fields is her interest in how images evolve and accumulate meaning, becoming familiar, iconic and part of the narrative of art, popular culture and wider history. Ben Borthwick, Artistic Director of Plymouth Arts Centre, said: “I have been talking to Rose about her work for over a decade but never had a situation where we could do a show together. So when I started at Plymouth Arts Centre in 2014, this was one of the first exhibitions I commissioned. I knew Rose would be interested in Plymouth’s histories and myths and am delighted she has made a new cycle of paintings about the Mayflower to be shown with existing work on a range of themes that speak to Plymouth’s magnificent history and gritty present. The works selected for Plymouth Arts Centre and The Gallery at Plymouth College of Art focus on Rose’s interests in film, fashion and history and respond to the context of the two galleries, their architecture, location and programmes. Plymouth Arts Centre present Wylie’s new Mayflower paintings alongside themes the artist has painted for many years that are central to Plymouth’s history, including the Tudor period, the Blitz, and the city as a seaside resort. There will also be a selection of Rose’s ‘film notes’ paintings about Plymouth Arts Centre’s 70-year history as a gallery/cinema. Ben Rivers’ film What Means Something (2015) reflects on this friendship with Rose, her work, and artistic processes they have in common. It will be shown as part of the exhibition. At The Gallery at Plymouth College of Art, focus is given to the depiction of the female form, with a series of paintings (from 2002 to 2016) presenting pin-up girls, fashion models, sports players and some self-portraits. This exhibition will tour to Newlyn Art Gallery and The Exchange, 9 June to 15 September 2018. The exhibition includes a filmed interview between Rose and Hans Ulrich Obrist, Artistic Director of Serpentine Galleries, made for her recent exhibition QUACK QUACK. Rose Wylie is based in Kent, was born in 1934 and graduated from the Royal College of Art in 1981. In 2017 Rose’s exhibition at the Serpentine Gallery was widely acclaimed, and she has had solo exhibitions at Space K, Seoul, Chapter, Cardiff, and Turner Contemporary, Margate (all 2016); Douglas Hyde Gallery, Dublin (2015); Städtische Galerie Wolfsburg, Germany (2014) and Tate Britain, London (2013). 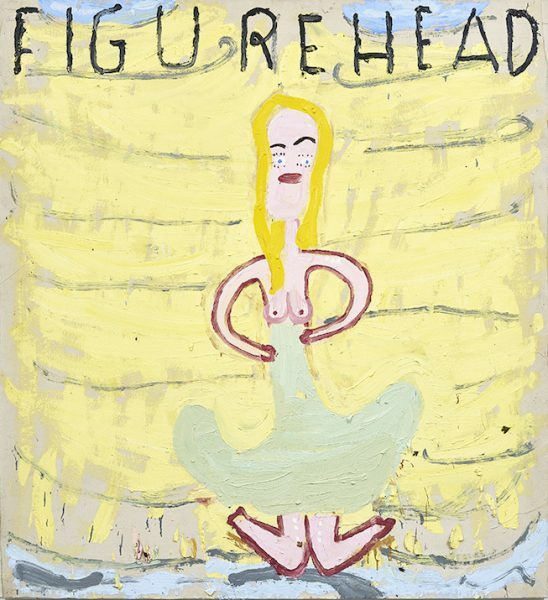 Rose Wylie is represented by David Zwirner, New York/London and Choi&Lager, Cologne/Seoul.